Ty Pennington the Hollywood film and TV Star made quite an impression on the Portreath community in May. The end result of a manic week is a play park the village can be proud of. The week started on the 12th May when the TV Company, TwoFour Productions rolled into the village in a huge Winnebago, which was parked up at the Portreath Arms. TwoFour worked from the vehicle and also based their HQ at St Mary’s Church Hall. Work proper started on the 13th with the arrival of Ty Pennington who made a grand entrance into Sunnyvale Road Playground and was immediately surrounded by the very excitable village kids. He finished the tour of the playground on top of the old climbing frame still surrounded by kids and promised that with the help of the community he would transform our well used but often flooded and very tired park into a much better area. That evening work began and from that day until the 21st the park became a hive of industry. As well as local contractors, there were volunteers from the local community and Kerrier District Council officers beavering away day and night. The project came to an end on the afternoon of the 21st with the unveiling of the park. Ty Pennington cut the ribbon accompanied by Captain Gordon Greenslade and Connie Trewella. The park was given its own name, chosen by public suggestions, of Greenslade Park. This is a very old local name and Gordon and Connie Trewella nee: Greenslade were both very touched by the tribute to their family. At the cutting of the ribbon the Park was flooded by the local community, all equipment was well tested and the planting admired. Overall impressions were extremely positive. Those of us involved in the project over the last 18 months are delighted that a project that was probably going to take years to complete has been accomplished in very short order, to a higher specification than we could have possibly thought possible. There were so many people involved it really is impossible to name everybody. I think suffice to say, all involved, in whatever capacity, can be very proud of the achievement they contributed to.The TV Company and Ty were very impressed with the community spirit in Portreath. A BIG ThankYou to all involved. A list of contributors has been supplied by the TV Company; I hope all involved are mentioned. 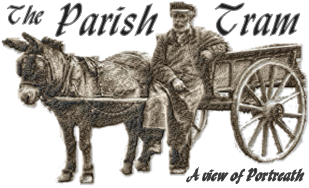 I will also publish the list on the Parish Tram web site, so if you wish to be mentioned please email me and I will add your name. Cornish Fixings - Wood, fixings, oil and many other items. Promenade Café – Tea and coffee for the whole week. Petition to allow Cornwall to have its own Centre of excellence for cancer surgery. In November 2007 Cornwall county council approved the transfer of some cancer services out of Cornwall removing the choice from cancer patients to get treatment close to their homes families and friends. Can be withdrawn and moved to Exeter or Plymouth. A cancer centre should be provided in Cornwall not only in Devon. Government and N. I. C. E. (National Institute for clinical excellence) guidance will allow this. It is difficult enough dealing with cancer, without the stress of travelling 100 miles away to receive treatment. Please sign to keep cancer care in Cornwall. We want a first-rate service in our county. Many properties in Portreath use oil for central heating and hot water. With the oil prices spiralling as they are it makes sense to buy in bulk. I am forming a collective group to do this and the savings are worthwhile. Based on a collective of 20 customers with a delivery of 500 litres each the savings would be 3.5p per litre, a saving of £17.50. More members more savings. IT’S a huge “felicidades” – that’s congratulations in English – to Portreath School who have just been named Spanish School of the Year. The school was visited by two representatives of the Spanish consulate on Thursday, after being shortlisted as one of five for the title. The visit proved highly successful, with the school declared the winners. Head teacher John Whetter was thrilled. He said: “We’re all very excited and very proud of the achievement. It’s a fantastic accolade. The two ladies who visited were really impressed with what they saw. “We introduced Spanish into the curriculum a couple of years ago. “All schools have to teach a modern foreign language by 2010 and we decided to start it early. The children love it. Portreath's biggest club is throwing its support behind £28 million plans to expand a holiday village.As planners prepare to determine the proposals for Gwel an Mor, surf life-savers said they believed the project would boost fortunes for the holiday village. The planning application earmarks a dry ski slope, a major new conference facility, a nine-hole golf course, an equestrian centre and more holiday lodges. Bill Haslam, who owns Gwel an Mor, joked that a few local opponents had described the proposed development as "hell and more" when the master plan was unveiled earlier this year. Now Portreath Surf Life Saving Club has countered the concerns by formally writing to Kerrier Council in favour of the scheme, with chairman Rob Phillips collecting supporting signatures from the club's 300-plus members. "We like to think we are as much at the heart of the Portreath community as anybody and we are absolutely convinced that the opponents are a very small number indeed," said Mr Phillips. "I cannot recall speaking to anyone who is actually against it. "We have studied this scheme very closely and have had extensive talks with Bill Haslam and we feel certain that it will be a major boost for the area in so many ways. "The range and quality of the facilities proposed are way beyond whatever we are likely to have proposed for Portreath by anyone else, and I would say 95% of the village is right behind it. "We are a fast developing club and we are very confident that we can continue to grow in tandem with Gwel an Mor." Mr Phillips said residents of the holiday village would soon be able to log on to scenes of the beach as part of a web-cam initiative that aims to promote Portreath on the Internet. Mr Haslam says his development would create up to 120 new jobs and provide a £3 million boost for the local economy. The first phase of Gwel an Mor, including 28 holiday lodges and club house, opened last year. A further 32 lodges are being built. In June, Portreath Parish Council supported the latest expansion proposals, subject to various conditions. At its meeting, a handful of local residents said they believed the planned development would blight the appearance of the village. Mr Haslam said: "I am hoping for early planning approval so that we can start work on the project by the end of the year and be up and running by 2010. It involves a range of all-year-round facilities that will offer something for everyone - with a tremendous boost to the local community and its economy." The plans are expected to be considered by Kerrier Council next month.